Introduction: Mary Harrell-Sesniak is a genealogist, author and editor with a strong technology background. In this guest blog post, Mary discusses 9 common mistakes made when doing family history research, and suggests ways to avoid them. Family history researchers are often frustrated by the mistakes of others—particularly when there is an obvious error in identity, such as the mistake explained in this 1914 Virginia newspaper article. 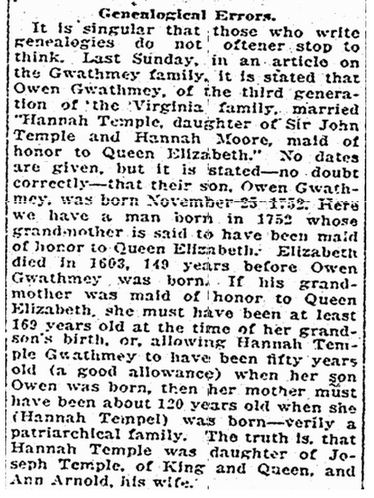 It points out that a member of the Gwathmey family was incorrectly identified as having been a maid of honor to Queen Elizabeth. Richmond Times Dispatch (Richmond, Virginia), 17 May 1914, page 41. This sounds like an obvious mistake, and one that could have been corrected with simple subtraction. Unfortunately, once a mistake is written in a book or newspaper article, the mistake is often carried into other research—forever frustrating the more serious genealogists. Genealogical mistakes are not often easy to sort out, so let’s discuss some strategies. In the case of the first abbreviation, “NA” might indicate non applicable, naturalized, Native American or even Navy, demonstrating the importance of finding the “key” explaining what an abbreviation actually means. Another abbreviation that sometimes causes confusion is the use of “NMI” in place of a middle name. It is not an actual moniker, but rather used to indicate that a person has no middle initial—no middle name. Women who are too old to be mothers. Although Mrs. Steve Pace, of Rose Hill, Virginia, reportedly gave birth to her 17th child in 1939 at the age of 73 (see the Wikipedia article “Pregnancy Over Age 50”), it is rare for women to give birth over the age of 50. If a woman continued to give birth through her 40s, then it is possible that a report of her having a child as an older woman may be correct. However, whenever you see such an older mother-child relationship claim, examine the possibility that the family may have been raising an orphan or a grandchild. Persons who were born too young or old to have served during a military event. If you are researching an ancestor for a lineage society, such as the Sons or Daughters of the American Revolution, start by figuring out the beginning and ending dates of the event. For example, the American Civil War occurred between 1861 and 1865. Although there are examples of very young veterans, most of the younger set did not serve in a military capacity—unless they were older. One exception was Civil War Missouri veteran George Huffman, who enrolled as a volunteer in the 13th Missouri Infantry on 4 November 1861 at the age of 14. 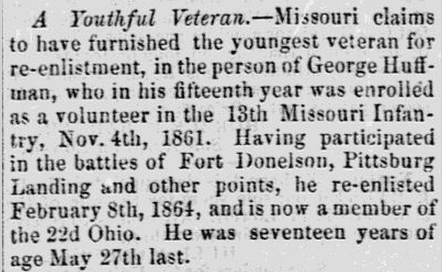 He re-enlisted on 8 February 1864, and was considered to have been the youngest veteran to have re-enlisted that year—as explained in this 1864 Massachusetts newspaper article. Lowell Daily Citizen and News (Lowell, Massachusetts), 2 September 1864, page 2. For the most part, however, it is safe to assume that someone—other than a drummer or bugler—must have been at least 15 when he enlisted for combat service. Therefore, it is unlikely that a combat veteran actually served in the Civil War if he was born after the year 1850. Now, if a child served in a non-military capacity, then you might find evidence of children as young as seven involved in a war—such as Nathan Futrell, a young boy who served in the American Revolutionary War. Greensboro Daily News (Greensboro, North Carolina), 3 January 1971, page 24. You can also apply an age factor to determine the likelihood of an older person serving in the military. Just because you can’t find a genealogical proof doesn’t mean that one doesn’t exist. For example, many military records were burned, so look to other types of records for evidence. In other words, if an original record is missing you might be able to find alternate records. In the case of a missing military record, look for a petition for a pension, or a list of enlistments, reprinted in an old newspaper article. Other possible genealogical sources: a family diary or letter, or church bulletin, that references military service. Just because a child is not recorded with a parent on a census record doesn’t necessarily indicate that both parents are deceased. On one of the 1850 U.S. Federal Census records, I noted that the children of my ancestor Permelia Ann (Davis) Drake were living in different households. Not finding their mother, I at first assumed that she had died. It turned out that she was very much alive, and recorded in the census with her second husband, Samuel Bassett. It’s not clear why the children were with the neighbors in 1850, but perhaps they were mother’s helpers or farm helpers working to support the family. A primary record is one that was recorded at the time of the event. A secondary record is one that is recorded later, generally from an informant. In the case of a death certificate, the date and place of death is primary evidence, but the birth date of the decedent, along with the stated parents, is not necessarily correct. In my family, my great-grandfather’s parents were recorded on his death certificate as his natural parents, when in fact court records and other records establish that he had been adopted. In the case of my ancestor William Harrell of Virginia (and Indiana) of the late 1700s and early 1800s, it turns out there are three men by the same name. Now that descendants have submitted results from DNA studies, it is clear that they were not closely related. Alternate spellings are the norm, rather than the exception. For example, my Ebling ancestors can be found with the surname spelling Ebeling, Hebling and even Heblinger. As a result, I always browse a book’s index to see if there are similar spellings. When searching online or in a search box, such as at GenealogyBank, I frequently use a wildcard such as a question mark (?) or asterisk (*) when searching for ancestor names. Many people, including myself, are prone to transpositions. The year 1787, for example, might be unintentionally entered as 1778, or even 1877. To overcome this tendency, be sure to closely examine recorded figures, such as the reported age at death. Several genealogy programs calculate this figure, and may even note it during an error check. In the event of a divorce, separation or bigamy, a spouse might be recorded as widowed on an official record. This may be to handle a delicate issue, or simply to accommodate a census form that didn’t have other options. These are just a few common genealogical errors. If you have some that you have observed, please share them with us on Facebook or our blog page in the comments section! Very nice article!!!! I love it when I find children who have children that are older than themselves! I usually can’t avoid making some Smart-a– comment about how gifted those folks were to be able to produce babies either before they wee born or after they were dead. Very precocious! I learned a lot, thank you. Glad I had you on my Facebook. I feel like I can find more information now because of the above mistake indicators. I need to get back into my Ancestry.com also. God bless. I try hard to double check my work and “think through” conclusions. And I am very happy when others researchers point out possible errors or inconsistencies. But in this era of “shaking leaf” research, I think some people take the attitude that of they find something online it must be true. I noticed that the surname of Temple was also spelled Tempel but the author of the article never explained why. I wonder if it may have been a mistake that got by them as well. I encountered a family where 2 persons in the family had the same name…James and James A. They were supposedly brothers but were born and died on the same day. Depending on when in time you are talking about it was common for families to re-use names for their children. One branch of my tree had three Samuels before one lived past age 3. Thank-you!! Finally a genealogist’s findings that reinforce what I have stressed to others for years regarding mistakes on family trees. This information is valuable in correctly identifying family members. Truly enjoyed your post on common genealogy errors. I am president of the Wabash Valley Genealogy Society in Terre Haute, IN. We publish a 12 page newsletter six times a year. Would it be possible and would you give us permission to use your post in our next newsletter? We have approximately 170 members. The newsletter is typically sent out via email with a very small number of people receiving hard copies via US mail. If you prefer we not use your post, I perfectly understand. Just thought I’d ask. Thanks for posting those 9 common genealogy mistakes and errors. I hope someday when people post on RootsWeb or Ancestry they will be able to go back and correct their mistakes. It is frustrating sometimes to find something only to learn that it is not true. My most common mistake is baptisms that occur before the birth. This seems to be very common when people have a program that automatically assumes a default date unless set differently or when civil registration takes place in quarters. ex the GRO index in England may have birth registered in the first quarter of the year which ends in March – the person (or shaking leaf) finds the records and puts in the birth as Mar 1845 not noticing that they have a baptism of Jan 15 1845. Thank you for such a great list Mary. Thank you for all the positive feedback. So glad you enjoyed the blog article. I think I have found my great-grandmother when she was 6 years old, living with a relative whose maiden name was the same as my great-grandmother’s. The relative , however, could not possibly be the 6 year old’s mother. I’ve always assumed my great-grandmother was an orphan. Now, thanks to your clue, back to the drawing board. I have also nicely explained to some that the person on their tree is not the right person. I include the facts, both right and inconsistent. Most are appreciative but a few don’t want to hear about it. I make sure that I don’t add any of their research to my tree without thoroughly vetting it. I have had to go back and take out way too many people that turned out not to be related. I keep a public tree with confirmed ancestors. Those that I am investigating or just not sure of go into a private tree. I don’t want people to be mislead by what I am not sure of. When they are vetted I add them to my public tree. I’ve noticed that “careless” researchers will accept obviously inconsistent data without applying common sense … even when those inconsistencies are shown to them! Programs/sites like “Ancestry.com” have wonderful “helper” features, but hints must always be examined before applying to your line. I have run into a researcher/s who, in obvious effort to overcome what they must feel is a “brickwall”, has linked a woman who lived and died in France in the 18th century to an Irish ancestor they have placed in the early 19th century in Pennsylvania. After a bit of pondering. I realized that the “soundex” hint in Ancestry.com showed the French woman as a possible link. Rather than consider the impossibility of a dead French woman appearing in Pennsylvania, the researcher made this hint into an “Aha” moment. When I pointed out the improbable link, I was ignored, and that erroneous data is now linked to a veritable crowd of other family trees who have accepted the link without consideration of possible error. Aargh! My great grandfather was born out of wedlock in 1837. His mother was listed as a “Widow” in the 1880 census. She was living with her son. The family was very sensitive about this subject. Thank you so much for those tips. Especially the last one about widows and widowers. That was an idea that I’ve never had the occasion to ponder before, but great to keep in mind. And thanks to reading other replies, now I think I’ll set my working tree to private as well because of my odd method of sorting through things. I have the habit, that any of those “shaking leaves” look at all close to right (even if they turn out not to be) I still add them, because I’ve had many times where I can do a better job getting to the truth by having all the information in front of me even if it’s wrong. I’ll compare different generations because they often get mixed up when they have similar names, and sometimes I’ll find the information is right, just attached to the wrong person. I also found a time when brothers were mixed up as the father of the person I was working on, and that mixed up information gave me that clue. It’s especially easy for those kinds of mixups or happen (or claiming a sibling as a parent) when you have cases of multiple generations with the same name. I have one line that started out showing Thomas, son of Thomas, son of Thomas, son of Thomas, son of William and it turned out to correctly be Thomas, son of Thomas, son of William (sibling), son of Thomas, son of William. Dates are so important in cases like that. And as for mixing up numbers in dates, well that’s just extra bad if you’re a dyslexic amateur genealogist like I am. But it also makes you pay extra attention at the same time. Thanks again for this great post! Thank you for writing and happy to know that you enjoyed the tips. Loved your analysis of how you straighten out issues. Thank you so much! I am currently going back and making sure everything in my tree is factual and correct–it’s tedious! I wish I would’ve realized that I needed to be more careful in the first place. GREAT article with GREAT advice! Note: I almost forgot to mention that I was led to your article when performing a Google search for “Nathan Futrell”, the little drummer boy you mention in your article above. I am one of his descendants!